Dan Dare, Pilot of the Future is a British icon. He was created by Frank Hampson in 1950, and first appeared in the Eagle comic where he was an instant hit with the British public. Almost a decade after the original series had ended, Dan Dare was resurrected in the pages of a brand new sci-fi comic for boys - 2000 AD! In this volume: Dan Dare and the crew of the Eagle One continue their journey through deep, uncharted space, where they encounter a host of evil alien tyrants, including Ddare's arch-nemesis the Mekon! 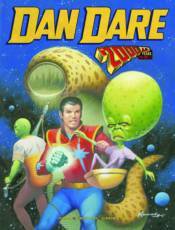 This volume of Dan Dare concludes the iconic British hero's adventures within the pages of 2000 AD.